So we love quick and easy snacks around this house! One of the most loved snacks for me growing up has always been puppy chow. 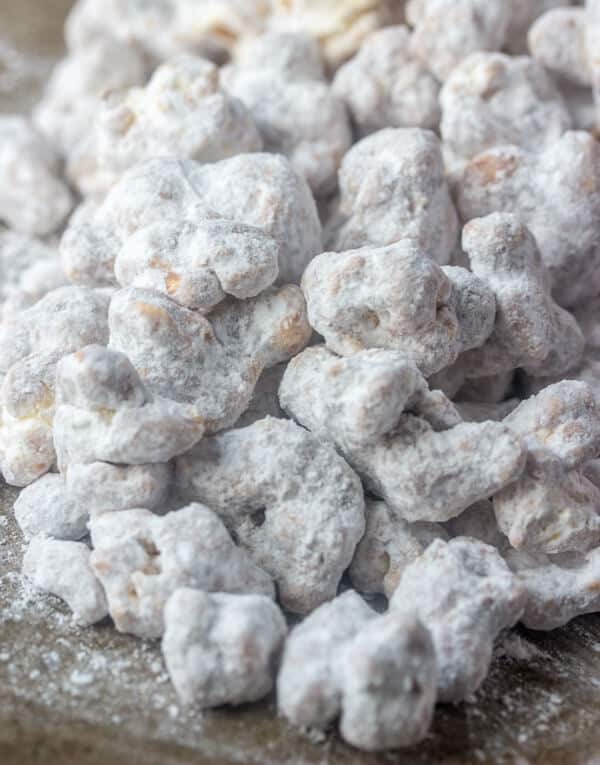 Now it may also be known as Muddy Buddies to some, but I always grew up with know it as Puppy Chow, but call it what you want, one thing we all know is that it is down right delicious. Now we don’t usually keep Chex on hand at this house and I had a SERIOUS craving for the stuff so I said hey, maybe it would be good on popcorn. And boy was this girl right! 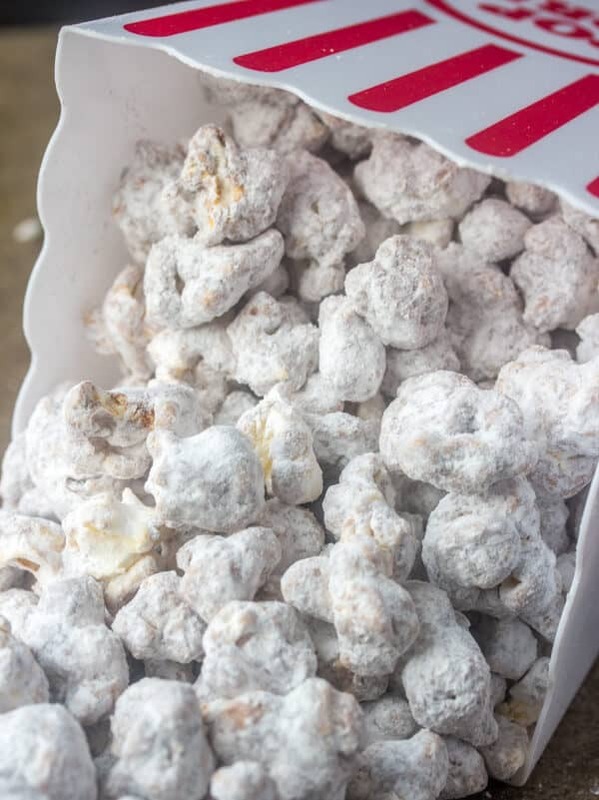 You guy’s have never had sweet popcorn until you try this Puppy Chow Popcorn! It whips up in minutes and the kids and adults go NUTS for the stuff. I had it out at my house when we had family over a few weeks ago and my mom told me that I had to move the bowl because she was going to eat it all. And if you know anything about my mom it’s that she is the absolute pickiest person on the face of the planet when it comes to food. So finding a dessert or a snack that makes her go wild is amazing. 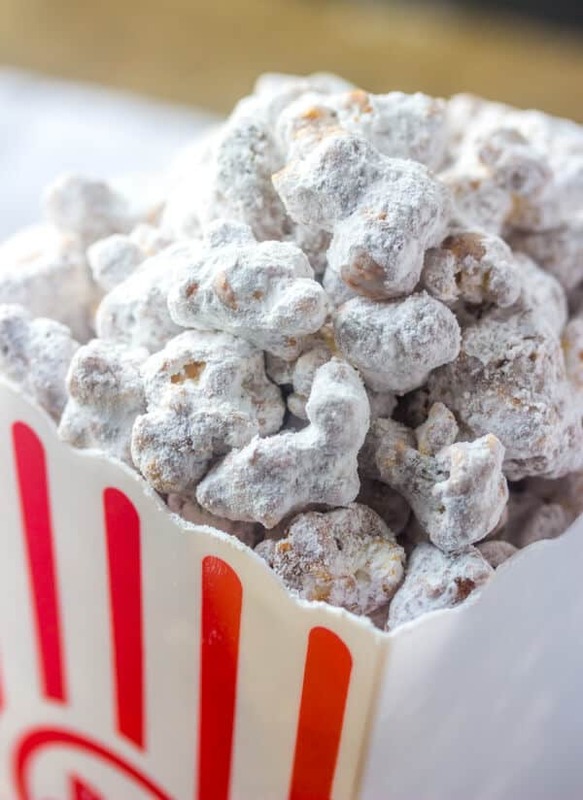 This is a fun recipe to make with the kids because we use a large paper bag and shake it all around to coat the popcorn in the powdered sugar. It’s really fun actually, not all the time do you get to shake, rattle and roll your desserts! So as much as I enjoy making this, the kids do as well. All you need is two bags of popcorn, any kid will essentially do. We made ours with butter and it didn’t affect the taste at all. You can also make homemade popcorn or use lightly salted as well. Then you melt together some peanut butter and chocolate chips, coat the popcorn in that, shake it in some powdered sugar and presto you have this Puppy Chow Popcorn. Now this makes a large bowl, I didn’t want to scale it down at all because when you make this Puppy Chow Popcorn you’ll want a bunch! Trust me, its like Pringles, once you pop you just can’t stop. This was gone in the first day that it was made. So this is why we keep making it for gatherings! It would also be the perfect Christmas treat to give to family or friends in a goody bag this year. Just put it in a cellophane baggie and tie it up with a bow and hand it out. You could also add some holiday sprinkles to make it a little more festive if you’d like! The possibilities are endless! So trust me when I say that this Puppy Chow Popcorn will be your newest and most favorite snack ever. Plus who doesn’t love quick and easy treats that you can make with the kiddos on short notice for after school, a party, or just because! 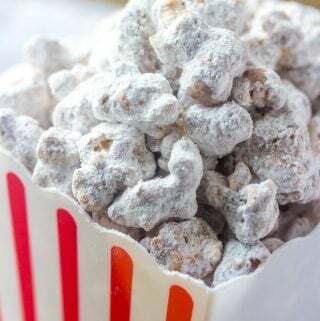 This Puppy Chow Popcorn is quick, easy and a seriously tasty snack recipe that you literally won't be able to keep your hands off of! In microwave safe bowl add your chocolate chips and peanut butter and heat in microwave in 30 second intervals, stirring until melted. Place half of your popcorn in large bowl and drizzle half of your chocolate/peanut butter mixture and stir until coated. Add remaining popcorn and chocolate/peanut butter and stir again to combine. 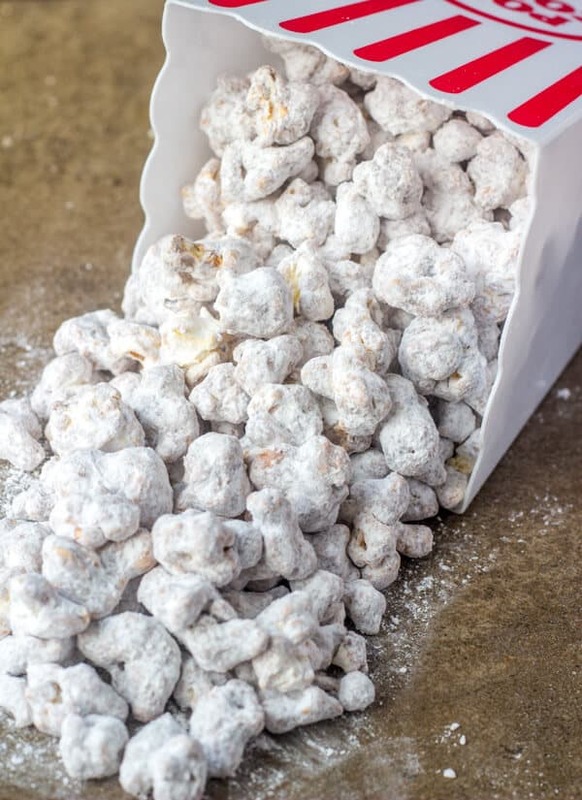 Add your popcorn mix to a large paper bag and pour your powdered sugar over. Seal bag and shake for a few minutes to ensure even coating. Dump into large serving bowl and enjoy!